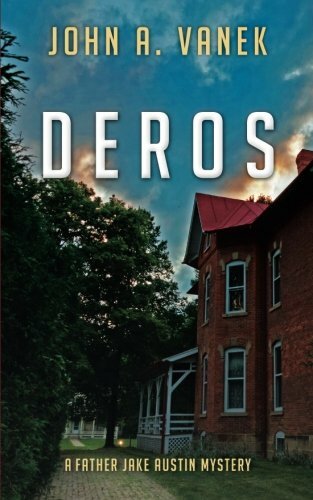 “Deros: Date of Expected Return from Overseas” by John A. Vanek is the first novel in his Father Jake Austin series. This mystery kept me guessing until the last clue had been discovered. Jake Austin is a very complex character who has literally lived his life in opposite ends of the spectrum. Once he was a popular football star with a beautiful high school sweetheart, now he is a physician and Vietnam veteran called to the priesthood. The story is set in Oberlin, Ohio in the year 2002. Nicknamed “the town that started the Civil War,” this location was so interestingly described by the author that I was actually compelled to research its history. I liked the author’s use of an existing location rather than an imagined one, and his ability to weave the history of the town into the storyline was arresting. In this novel, Father Jake Austin is assigned to cover for the ailing priest of his hometown church as well as work as a physician at the local Catholic hospital. His worry about returning to face his high school sweetheart and first love Emily is faced head on as he is pressured to attend his 30th high school reunion on his very first night at home. His arrival also happens to coincide with the murder of a young woman that has his old football friend, and current police chief, Tremont “Tree” Macon, in a state of total bewilderment. A threatening note, the collapse of a classmate, and the drunken ramblings of his old flame’s ex-husband are just a few of the things he encounters. And that is just during the reunion. His first few days in his old home town are filled with emotion, discovery, excitement, and suspicion. I loved reading a book written completely from the male perspective. The author is so descriptive when detailing the contrasting emotions that Jake feels. Between his feelings for Emily, his past in Vietnam, and his vow to the church, Jake is an extremely compound character. It was very refreshing to me, like looking into the male intellect, or getting a glimpse of the opposing team’s playbook.